The woman [at Jacob's well] left her water jar beside the well and ran back to the village, telling everyone, "Come and see a man who told me everything I ever did! Could he possibly be the Messiah?" 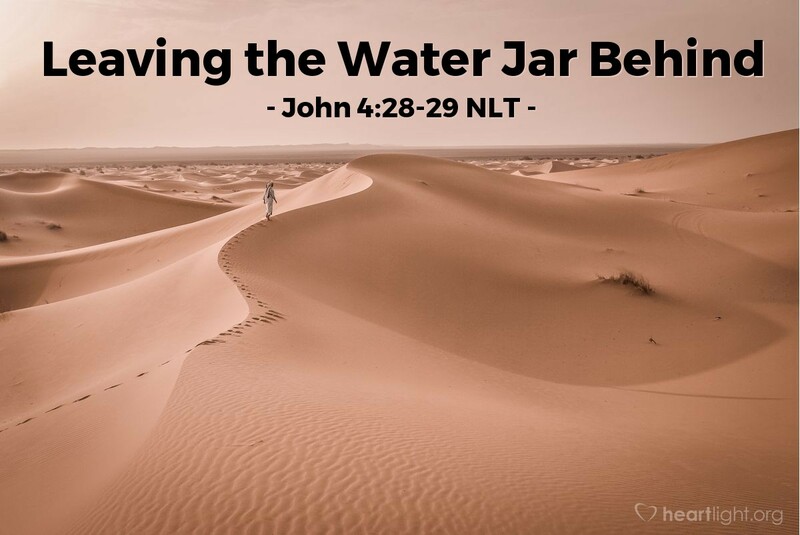 Can you imagine coming to the village well by yourself in shame and returning to the village, leaving your water jar behind, proclaiming the gospel to the people who rejected you? This woman had found it! She had had a drink of living water. Her life, her influence, her world was suddenly changed ... redeemed ... and made significant. Have you been blessed by the Christ? Have you received a drink from the Messiah? Then why not join this unnamed woman and invite those in your world to come meet Jesus so they can also find the Messiah?! Holy and righteous Father, please give me a powerful sense of your mission for my life. Use me to influence others to come to Jesus. In Jesus' name and for his glory, I pray. Amen.